This exclusive potato chips line is specially designed for the production and packaging of potato chips of excellent quality and less fat pickup. The whole process is based on technology accepted worldwide, modifications are incorporated to meet local conditions. We provide turn-key project execution along with complete technical support and free training. This fully automatic potato chips production line is of low investment and profitable. The processing capacities are 60kg/h, 150kg/h, and 300kg/h, we can also customize special plants based on your requirements. 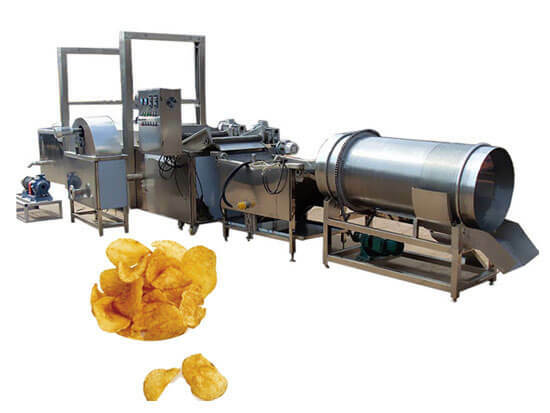 The line is specially designed for the production of Potato chips of different qualities – Potato sticks, French Fries, Potato crisps, Cassava chips, Banana chips， Sweet Potato Chips & Fries. ◆ Excellent potato chips quality with bright color. ◆ Proven technology for easy and safe operation. ◆ The frying machine adopts oil-water mixing technology, so the sediment can be cleaned easily. ◆ Less oil residue for the potato chips. ◆ Professional personnel give full-course guidance and installation, we also provide free training for operators. ◆ The machine working video is available. ◆ The exclusively researched formula for making crispy potato chips will be provided for customers at free of charge. 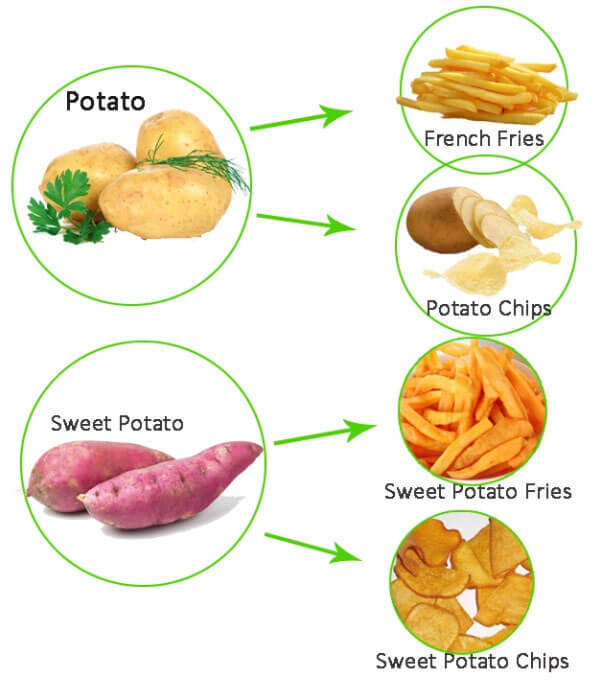 Hoisting feeding–Potato washing and peeling—-potato picking trimming—-fresh potato cutting—-potato sticks/slices rinsing —potato sticks/slices blanching —potato slices dewatering—-potato chips frying—-potato crisps de-oiling—potato chips flavoring–conveying—frech fries packing. 1. An elevator is used for transmitting a large number of potatoes into the feeder. 2. 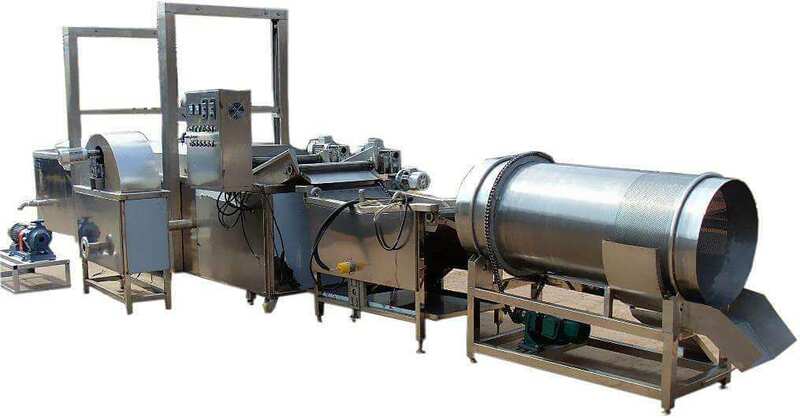 The potato cleaning and peeling machine integrates the function of washing and peeling, it can be used for processing potatoes, carrots, cassava and other root vegetables. 3. The potato slices rinsing machine is used for blanching products of slices, strips, cubes of any root vegetables like potatoes, carrots etc. Uniform heat transfer and controlled temperature & time. The main purpose of blanching is to ensure potato chips a bright color and crispy. 4. Dewatering is prepared for the frying part. The dewatered potato strips are low in moisture and easy to fry. Our potato chips dewatering machine adopts the centrifugal principle, through the fast rotating barrel to remove the chips surface water. 5. Frying is an important step. The edible oil temperature should be around180℃; when the potato chips become golden and soft, they should be fished out. The automatic potato chips frying machine adopts indirect oil heating and less oil in the system for good oil quality and better oil management. 6. The potato chips de-oiling is next step. De-oiling will make the fried food crispier and more palatable. 7. The following is flavoring. Customers can season diversified flavors totally according to their own intentions. 8. The last step is to pack potato chips with automatic food packing machine. ☆ This plant area for the capacity of 60/150/300kg/h is respectively 200/300/400㎡. ☆ The proportion of potatoes and output of potato chips is 3.5:1. ☆ The formula should be added during blanching process, suitable blanching temperature is 70℃ and blanching time is 7-15 minutes. ☆ Frying time for potato strips and potato chips is respectively 6/3 minutes. Frying temperature is 180 ℃. ☆ 6-8 workers are enough for the whole potato crisps line operation. 1. Nowadays, America is the NO.1 consumer of potato chips in the world and crispy chip keeps the top-seller for many years in the USA. 2. India is one of the largest producers of potato. The potatoes are mainly made into chips or wafers as a snack food. The main consumers of potato crisps are families especially in urban and semi-urban areas as well as hotels, canteens, and restaurants. 2. As a worldwide popular food, potatoes are second only to rice in human consumption. And the thin, salted, crisp potato chips are people’s favorite snack. 3. The potatoes used for making chips are fresh ones, that is to say, there are no scars, no rotten potatoes.